On a recent trip to Albuquerque, Jennifer and I were impressed by what our uncle and cousin had done to maximize the efficiency of the fireplace in our uncle’s home. They’d used common materials and Savage ingenuity to capture some of the heat escaping up the chimney. 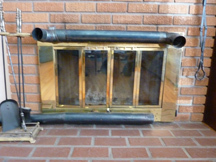 Realizing that traditional fireplaces waste energy, they first looked into getting an insert, but they decided that an insert would take up too much of the fireplace box. They figured out how to coax more heat into the room by using flexible exhaust pipe laid along the floor and up the back of the fire box. They used a chassis punch to make some of the holes for connections and for other openings, they used a hole saw. Then they sealed joints with RTV high-temp silicone adhesive. 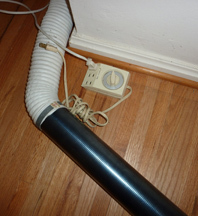 The cool end of the exhaust pipe runs into dryer exhaust hose. 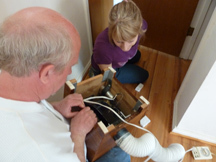 The other end of the dryer hose enters a wooden box that Uncle Art and Cousin Mark constructed. The box is hidden in a closet around the corner from the fireplace. Inside the box is a fan that blows air through the tubing system. 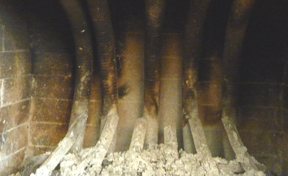 Air traveling through the flexible exhaust pipe inside the fireplace comes out toasty warm on the other end and helps heat the entire home. Our purpose isn’t to give you step-by-step instructions on how to do exactly the same project on your own fireplace. We simply want to encourage you to think creatively concerning your own energy challenges. Thanks to the Fiercely Frugal Savage Brothers for providing the inspiration! 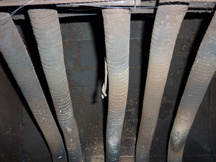 SAFETY ALERT: Of course you’ll want to check your local fire codes before undertaking any fireplace modifications. And since this project entails the use of chemicals, sharp tools, and electricity, and the finished product will be subjected to extreme heat, we strongly suggest that you review our Legal Babble page, too. Thanks! 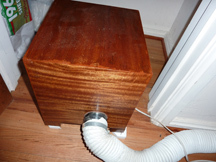 This entry was posted in Savage Energy Savings and tagged creative solutions, energy savings, woodburning. Bookmark the permalink.